Skimming many of the leading technology outlets, you would think RSS had given up its ghost, making way for new services, like Twitter. Just this week, ReadWriteWeb claimed the RSS reader market was in "disarray" and continued a "decline". This came after a summer in which TechCrunch IT's Steve Gillmor declared RSS dead and suggested that it "rest in peace" and others ditched RSS for microblogging lists. With the world watching Twitter's top names and their Suggested User List-boosted following counts cross well into seven digits, data from FeedBurner and other sources shows RSS counts climbing - in some cases dramatically - for nearly all blogs, and a number of them also sport reader counts in the millions. While the independent market for RSS readers may be in bad shape, having ceded ground to Google Reader, RSS as a utility is actually growing. It's not going down, not by a long shot. Prior to ReadWriteWeb's alarmist article, back in August, I arrived at similar conclusions, when I said "stand-alone feed readers are collapsing", highlighting the fact that Google Reader, and followers on FriendFeed, dominated my personal statistics. That Google Reader and iGoogle have reached a dominant position in the market does by no means indicate the technology's death, but instead its maturity - something that, beyond aggregate reader counts, does not take in to account the fact that RSS is the mechanism for getting data between sites practically everywhere, even if it is not called out as such. In January of 2008, I highlighted the debut of a new service called Rating Burner, which aims to display the most subscribed to blogs that utilize FeedBurner. The site shows not only a leaderboard, but also the change in subscriber data from day to day. Data from Rating Burner shows green, positive growth across the board for feeds. And while total counts can always be debated as to their accuracy, sites including TechCrunch (with 4 million subscribers), the YouTube blog (with 2.4 million), Smashing Apps (with 1.5 million) and Simply Recipes (1.5 million) are into seven digits. This parallels the top Twitter accounts, who crest in the 4 million range, crowned by screen celebs Ashton Kutcher, Britney Spears and Ellen Degeneres. Yes, statistics are statistics. The high numbers for these well-known personalities is suspect, thanks to their inclusion on Twitter's Suggested User List, and it is also expected that some top blogs here are bundled and not read every day - adding to their counts. Also true is the fact that not every blog uses FeedBurner, and thus cannot be tracked as well. Many sites point instead to a raw XML file, keeping control. 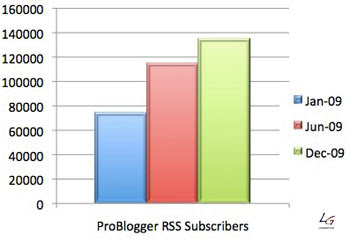 That said, regardless of the data's perfection, the growth in 2009 for RSS subscribers cannot be questioned. Google's Mac Blog Added 30k Subs to Top 70k. Mashable Added Almost 150k Subs to Near 350k. Also - keep in mind that my own personal numbers are inflated thanks to FriendFeed, but most non-personal blogs are not. So what is the point? The point is that while some services (read: Twitter and Facebook) may be getting many people's attention, and while it is also true that Google Reader has the lion's share of the RSS reader market, the current discussion around RSS being less useful, or less important, than in years past, is flawed, period. Lest this early adopter sound too much like a curmudgeon, just because something is newer does not automatically make it better, nor does it mean that there will be a rapid mass exodus from the previous technology. Just like Twitter can drive good traffic to a Web site, so too can RSS. Just like Twitter can pass along top content, so too can RSS. Just like top followed accounts can get million-plus audiences, so too can RSS. And both are growing in terms of connections, with no reversal in sight. Both are tools to be used well, and both are being used more than ever. The only "disarray" is in the current thinking.